Dental Care for Foals – In young horses, the most common issue is when a baby tooth does not come out or prevents mature teeth from coming through. These can cause the foal to have a painful mouth or infections. Behaviours that suggest that your horse may have one of these problems includes, drooling or foaming at the mouth, bad breath and chewing differently. As younger horses tend to have theses issues, some vets say it’s beneficial to have their teeth examined twice a year instead of annually. Dental Care for Mature Horses – As a horse ages, their teeth grow and as the horse chews they wear away the surface of the tooth which causes the tooth to become uneven. These sharp edges can cause painful cuts to the horses’ mouth, cheek & tongue. To help prevent these issues, your horse will have to have their teeth floated each year. Floating involves filing away sharp edges of the teeth in order for chewing surfaces to be smoother. The file used is normally called a ‘float’ hence the term ‘floating’. Frequent check-ups should be considered as this will give early indication of any potential problems, allowing them to be dealt with immediately. Dental Care for Senior Horses – As horses get older, they may begin to loose their teeth which makes it problematic for them to eat. This can lead to your horse not getting enough nutrients and losing weight. Signs that your horse may be suffering from tooth lose include, drooling and spitting out food. To overcome these problems, provide your horse with softer foods. Horses with missing teeth should have more check-ups, around 2-3 per year. This is an ideal opportunity to study Equido Level One is a concentrated two week course. The weeks are running consecutively but you can study just week one and complete week two later in the year on our next Fast Track (dates to be advised). Costs for the course is £300 per week and application forms can be downloaded from www.equidohorsemanship.co.uk via the application forms page and Induction Pack tab. Now is your chance to get in the first clinic of the year!!! 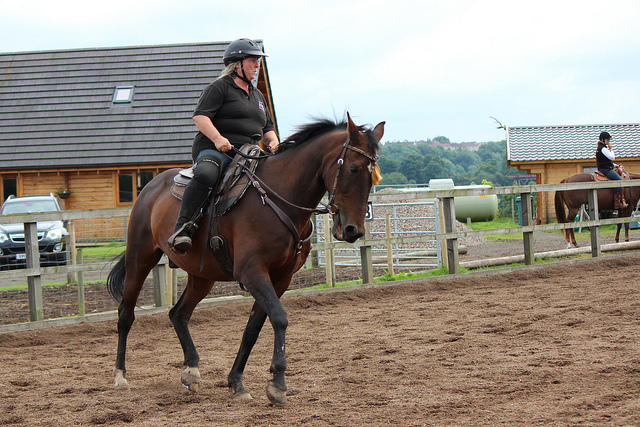 Three of our Equido Instructors will be on hand to teach and guide you through any issues ridden or groundwork that you may be struggling with. A great way to start your horse off after a winter break. 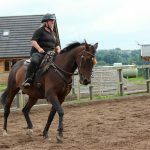 Ross Dhu Equestrian, Sunnyside Farm, Sunnyside Road, Quarter, Larkhall, South Lanarkshire. ML9 1RB. All content copyright © Ross Dhu Equestrian. Photography courtesy of Nikki de Kerf and reproduction elsewhere is strictly forbidden. No unauthorised reproduction of any materials contained within this website without prior written permission.